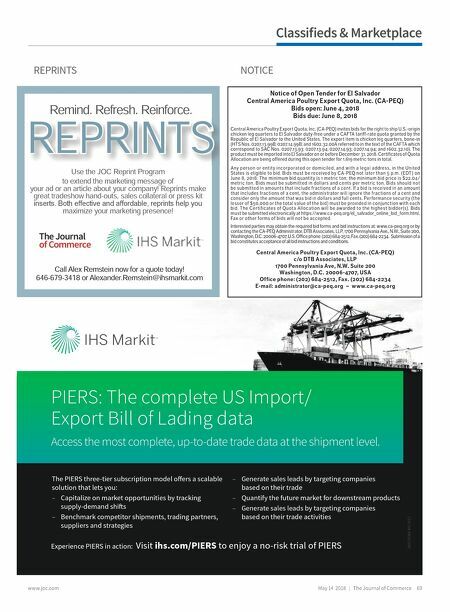 68 The Journal of Commerce | May 14 2018 www.joc.com By Colin Barrett Q&A A Q This cold case is costly for carrier I'm looking for your expert opinion on a civil summons we received, filed by the consignee on a damaged refrigerator. This item was a "sale" floor model sample with 0 hours purchased through eBay for $7,499.99. When the damage was initially reported, it was filed for repairs at $5,940.16. The claimant withdrew its claim for repairs and replaced it for the replacement cost, stating that those repairs are not possible. First, the initial damage report of $5,940.16 was limited to a visual inspection of the refrigerator. The unit could not be plugged in and tested because damage to both compressors and severance of the copper lines rendered it inoperable. The claimant was advised that additional dam- age may be discovered aer the refrigerator was powered up. Second, the extensive damage to both compressor units and the structural elements of the refrigerator will likely void the warranty. Because this item was a floor model, the buyer can no longer get the same item at the same price, so the claim was amended to $10,309.00 for the same unit sold by a different retailer. I've done some digging and could not find the same item for a lesser amount. It seems this particular style runs around $10,000. What are we truly liable for, the initial sale price of $7,499.99 or the replacement cost of $10,309.00? I GAVE YOU my best answer over the phone, to which I recall you reacted with a muttered expletive. I certainly sympathize with your response, but after thinking it over, I still believe I'm correct. 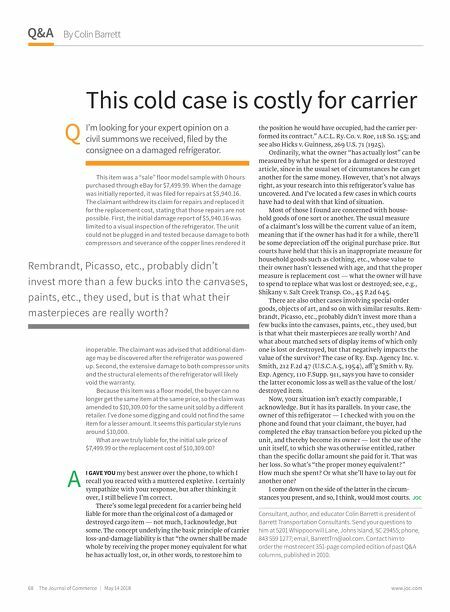 There's some legal precedent for a carrier being held liable for more than the original cost of a damaged or destroyed cargo item — not much, I acknowledge, but some. The concept underlying the basic principle of carrier loss-and-damage liability is that "the owner shall be made whole by receiving the proper money equivalent for what he has actually lost, or, in other words, to restore him to the position he would have occupied, had the carrier per- formed its contract." A.C.L. Ry. Co. v. Roe, 118 So. 155; and see also Hicks v. Guinness, 269 U.S. 71 (1925). Ordinarily, what the owner "has actually lost" can be measured by what he spent for a damaged or destroyed article, since in the usual set of circumstances he can get another for the same money. However, that's not always right, as your research into this refrigerator's value has uncovered. And I've located a few cases in which courts have had to deal with that kind of situation. Most of those I found are concerned with house- hold goods of one sort or another. The usual measure of a claimant's loss will be the current value of an item, meaning that if the owner has had it for a while, there'll be some depreciation off the original purchase price. But courts have held that this is an inappropriate measure for household goods such as clothing, etc., whose value to their owner hasn't lessened with age, and that the proper measure is replacement cost — what the owner will have to spend to replace what was lost or destroyed; see, e.g., Shikany v. Salt Creek Transp. Co., 45 P.2d 645. There are also other cases involving special-order goods, objects of art, and so on with similar results. Rem- brandt, Picasso, etc., probably didn't invest more than a few bucks into the canvases, paints, etc., they used, but is that what their masterpieces are really worth? And what about matched sets of display items of which only one is lost or destroyed, but that negatively impacts the value of the survivor? The case of Ry. Exp. Agency Inc. v. Smith, 212 F.2d 47 (U.S.C.A.5, 1954), aff 'g Smith v. Ry. Exp. Agency, 110 F.Supp. 911, says you have to consider the latter economic loss as well as the value of the lost/ destroyed item. Now, your situation isn't exactly comparable, I acknowledge. But it has its parallels. In your case, the owner of this refrigerator — I checked with you on the phone and found that your claimant, the buyer, had completed the eBay transaction before you picked up the unit, and thereby become its owner — lost the use of the unit itself, to which she was otherwise entitled, rather than the specific dollar amount she paid for it. That was her loss. So what's "the proper money equivalent?" How much she spent? Or what she'll have to lay out for another one? I come down on the side of the latter in the circum- stances you present, and so, I think, would most courts. JOC Consultant, author, and educator Colin Barrett is president of Barrett Transportation Consultants. Send your questions to him at 5201 Whippoorwill Lane, Johns Island, SC 29455; phone, 843 559 1277; email, BarrettTrn@aol.com. Contact him to order the most recent 351-page compiled edition of past Q&A columns, published in 2010. Rembrandt, Picasso, etc., probably didn't invest more than a few bucks into the canvases, paints, etc., they used, but is that what their masterpieces are really worth?